Making as much profit as possible is the primary goal of any business activity. If you run a business, you know that this is the main perspective you have in mind when setting your strategy. 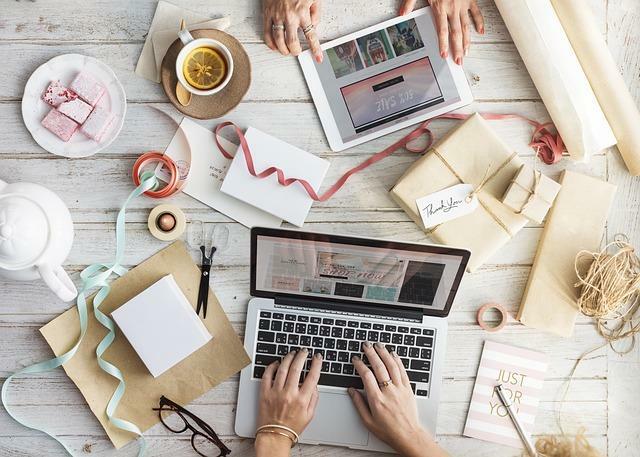 There are many ways to increase sales online and offline, either by increasing your number of customers, their repeat purchases or the amount they purchase each time. By operating online, you get the opportunity to boost your sales in a cheap way and increase brand recognition. Here are four ways you can increase your online sales and use the internet as a revenue opportunity. Your website is technically your first point of contact with your customers, whether you have physical shops as well or not. Indeed, most customers will check a company’s website and look it up online before buying products in their actual shops. It should therefore catch their eyes and not only attract them but retain them. Customers will only spend a few minutes, sometimes a few seconds on a website to make up their minds about a brand and decide if they want to look more profoundly into its products. These few seconds are what will create a first impression in the minds of the online customers, and first impressions are obviously extremely important and hardly changeable. That’s why website design is so important: the goal is to catch the customer’s attention quickly. This is where design, display, layout, organization and even colours play an important role and are essential to please customers and create a positive, trustworthy company image. No one wants to pay online on a shady website that doesn’t immediately seem reliable. The style and design of your website should suit your business and be coherent with its spirit. This is what is going to be a determinant of your online presence, brand building and consistency. It will make your brand recognizable, relevant and give you more credibility. You also need to provide your customers with good content. Every product should have its own page with a unique description that is clear and understandable. Your messages should be concise, straight to the point but also rememberable and understandable. They must generate interest in your brand and your products. To make your website even more trustable, you can create a space for user reviews. This way, new customers can rely on the honest opinions of other customers like them and relate to them to completely trust your company. Make sure your website is cross-device. It should be accessible and easily usable from any device (computer, tablet, mobile phone). It should be mobile-friendly but make sure not to focus only on that. It should also have an easy navigation. As you can see, having a good website is key to attract and retain a larger number of customers and plays a major role in the image your audience has of your company. It should therefore not only be aesthetically pleasing to your customers, but also tailored to each country you are targeting and translated in its language. Most online shoppers prefer to buy products online if the website is in their own language. Although universally spoken, English is not enough to reach every single one of your target potential customers. The world doesn’t only speak English. Also, not everyone speaks multiple languages. A customer will feel more inclined to purchase something on a website where they can fully understand all the information, which is also a question of trust. Making your website available in multiple languages through translation will increase your company’s visibility to target customers, as most of them will only look up keywords in their native languages on Google and other search engines when they are looking for a product or a service. Again, you only have a few seconds to catch their attention. If they can’t understand a word on your website, they will quickly switch to another one and buy from one of your competitors: you don’t want that to happen. You can’t convince your customers to buy your products if you can’t explain to them what they do and how they work, which is why language is such an important factor. Also, your competitors might not have multilingual websites, which makes it an opportunity for you to stand out and create a competitive advantage out of that. Your customers will feel more personally concerned and appreciated, which will improve customer loyalty and company image. Language should be considered carefully as every language has its own specific structure and codes, uses its own kind of expressions and has its own idioms, slang and jargon terms. To make sure you deal with this factor in the most reliable and efficient way, you can reach out to professional translation services, which will guarantee the work is done properly by native, skilled experts that will tailor your website to the language, the culture and the people you are targeting. However, your content should also be adapted to each culture you are addressing. That’s why you should not only translate your website but localise it. When introducing your brand to another country, there is a number of cultural aspects to consider to make sure you are addressing your new audience in the right way and adapting your strategy to its values, interests, needs and behaviours. It is not just about translating the language but localising the content and transcribing it to another language, another culture and most of all another population. Some languages may be spoken in several different countries, but you are still engaging with different markets, different cultures and different groups of people with their own characteristics. Therefore, you should transcribe your website and adapt its content it to the target market’s culture. You should accommodate it to fit the market and the customers you are targeting. As a simple example, if you are translating it to a language that is written from right to left such as Arabic or Hebrew, the display should also be adapted. The menu, the pages and the tabs should be presented on the appropriate side to meet the habits of the target customers, etc. You should also make sure the prices are presented in the local currency. If you live in the UK, you are shopping online, and you see prices in pounds, you will be able to have an idea of the extent to which you can afford them more easily than if they were expressed in Yens for example. This can only be beneficial for your website and help it seem more reliable and reachable. The names of the products should also be presented accordingly. For example, a jumper (UK English) is called a sweater in US English. You should make sure they are not characterized by terms that would refer to something totally different in another country. Cultural differences imply that every population, and even every group of people within each population (subcultures), has different beliefs, needs, interests and purchasing behaviours. In other words, not everyone likes the same things. Everyone has different preferences, which is why you should adapt to your target customers’ needs if you want to create a relationship with them. Your customers should immediately understand the structure of the website as well as what your brand is about and what you offer. Making it available in their native language shows acknowledgement and consideration towards their needs and their culture, which will be much appreciated. This could be a first step in building customer trust and loyalty. Going for a localised approach will allow you to create long-term relationships with your target markets in addition to an immediate boost to your sales. You will be able to address larger audiences in an efficient way and increase customer confidence in your products or services. To increase your sales, you need to increase the number of customers aware of the existence of your brand. To increase your number of customers, you have to promote your brand properly to reach the right people at the right time and at the right place. SEO techniques are a good way to do so. Making your website appear higher in search results on search engines will lead to more brand awareness and brand recognition. Very few customers go beyond the first results page and appearing on it will considerably increase the number of people visiting your website. You should also do your research in terms of keywords and find out what your prospective buyers look for on search engines (notice that not all countries use the same search engines and Google is not number one everywhere, sometimes local ones are used the most). Build a relevant list of locally researched keywords for each language and each country (you should distinguish these two factors, even the US and the UK will have different ones despite the fact that they speak the same language). You could also run a blog to provide valuable content for your customers to read and to increase their loyalty to your company, write articles and guest posts for other relevant websites and make a name for yourself by improving your online presence. You can use social media to advertise your business as well. Being active on social networks is a good way to keep your online presence and boost brand recognition. Your customers will be able to follow you and be aware of your new products and offers. It is an efficient means of communication. Planning an event? Make an announcement on social media so that people can come. It is an efficient way to target specific audiences with common interests in a more advanced way and to humanize your brand. It will allow you to personally get in touch with your customers and to directly interact with them. This way, you will be able to create a community around your brand with people that show a real interest in what you offer and to build durable relationships with them. You can also reach out to influencers that are in the same industry as you, so you can collaborate and further promote your brand in your niche. Having a nice website with relevant and well-organized content available in several languages, adapting it to your customers’ cultures and promoting your brand online will make it more recognizable, credible and trustworthy in the eyes of your audience. These are cheap efficient ways to increase your company’s visibility online, create more brand awareness and recognition and therefore to increase your online sales and profit.